Whenever John and I visit someplace new, we buy a magnet as a souvenir. I don’t know when we started doing this; my guess is sometime after we started “seriously” dating (whenever that was). 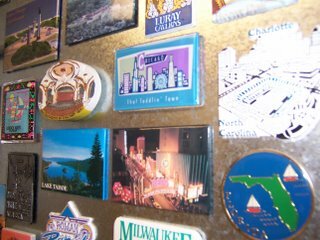 Magnets are a nice, small, inexpensive souvenir; they’re useful, they don’t generally break, and they don’t take up much room in your luggage. I think one of the earliest magnets we bought was from a trip to the Saratoga horse races back about fifteen years ago; the most recent are from New Mexico and Minnesota, where John traveled last month for some shooting matches. We have a couple of magnets from our 1993 honeymoon cruise down Alaska’s Inside Passage (although not nearly as many as I thought; some must have gotten lost when we moved into our current home a few years later). There’s quite a few from trips to the Outer Banks and environs. There’s a handful from John’s business and shooting trips. There’s about a half dozen from the San Francisco area, where I lived for three months doing Dirty Blonde. And there’s a wide variety from across the country, representing towns I played on the 2001-2002 Guys & Dolls tour. The magnets have always lived on our refrigerator, but with the last batch John brought back from his trip, I realized that the refrigerator was no longer such a great idea. For one thing, our refrigerator gets a lot of use and the magnets were always getting knocked off or covered by recipes or shopping lists or the latest drawing from a young niece. Since the refrigerator is close to the oven and stovetop, there’s a certain amount of cooking grease that’s going to land on it, and it’s finicky work cleaning off over one hundred small magnets. But where else to put them? One day when I was in the kitchen and thinking about the problem, my eye fell on the wall above my recipe book shelves. It was occupied by a couple of small needlepointed pictures that I’ve had for a lot of years. 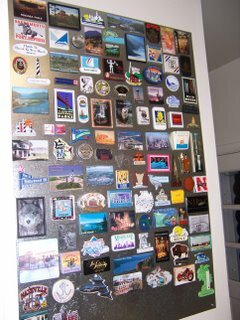 I took them down and eyeballed the empty space, in my mind’s eye seeing it covered with a thin metal sheet – just the thing to display the magnet collection. I made a trip to Home Depot and bought a 24″x36″ sheet of zinc. John screwed it onto the wall this evening, and I carefully cleaned off each magnet and transferred the collection onto their new space. I’m pleased. It looks good. The refrigerator is much improved, too (it got a good washdown during the changeover). It’s nice to be able to see each individual magnet without pushing aside a coupon or a reminder note. It’s nice that they’re in a place where they won’t get bumped and will stay cleaner. It’s nice to be able to see all the places John and I have been over the years and remember the good times we’ve had. It’s also nice to know that, while John and I have made lots and lots of trips and have the magnets to prove it, we still have plenty of space to fill on the new display. And when that space runs out – why, there’s always the refrigerator again.